We want to give a big thank you to Fabrika Fantasy, so many wonderful images and what a marvelous sponsor. Winner to be announced on May 2, 2017. Arlene couldn't help but color Autumn Fairy.at Fabrika Fantasy. Fabrika Fantasy has some fantastic digital images and the chipmunk I used below is a bonus, plus it is already colored in. These are all colors I would have chosen and he is a cute little guy. The challenge is Birthday. REMEMBER, I did NOT color this, it is an already colored digital image. Arlene and the Die Cut Divas. 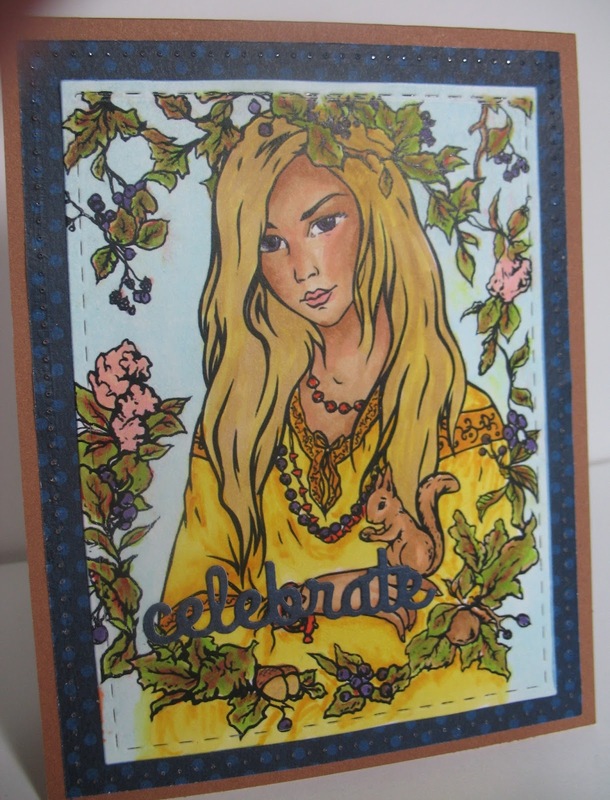 Cathie here with some more Fabrika Fantasy inspiration for our Birthday theme this month. I happened to be colouring it on a rainy afternoon so I used more spring base colours. I have a friend of mine who's birthday is coming up but is going through a hard time so I wanted a two fold sentiment for this card. This is is why I have a sentiment that flows from the front into the inside of the card. 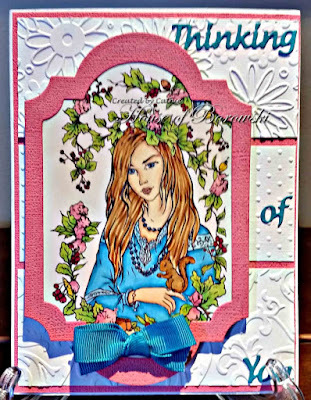 Cuttlebug Swiss Dots, Kaszazz Scrollwork, Darice Flower Frenzy Background Embossing Folders. Until next time have a great day!!! 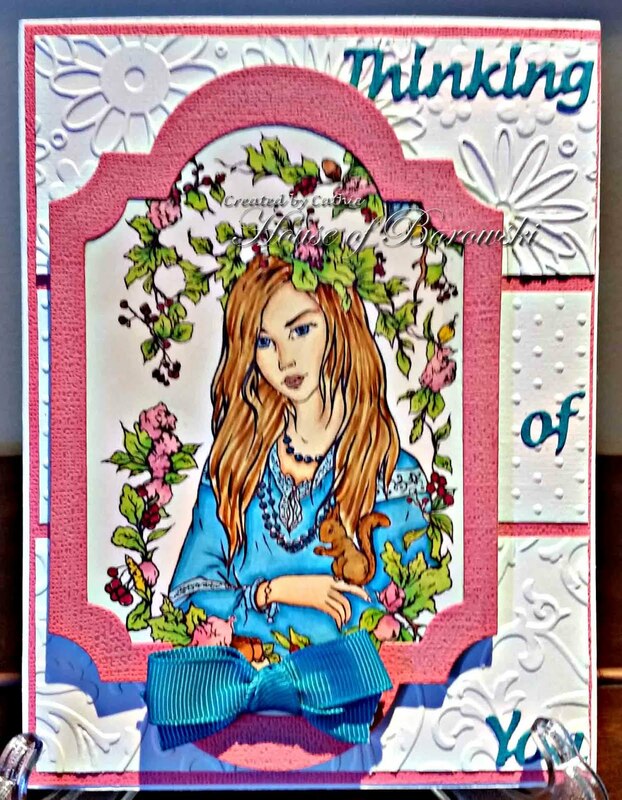 Welcome back to Die Cut Diva's. Monika here to share another "Birthdays" project. I made a card for little princess. Come and join in to fun and make some "Birthdays" projects!! Looking forward to see your creations in the challenge gallery! 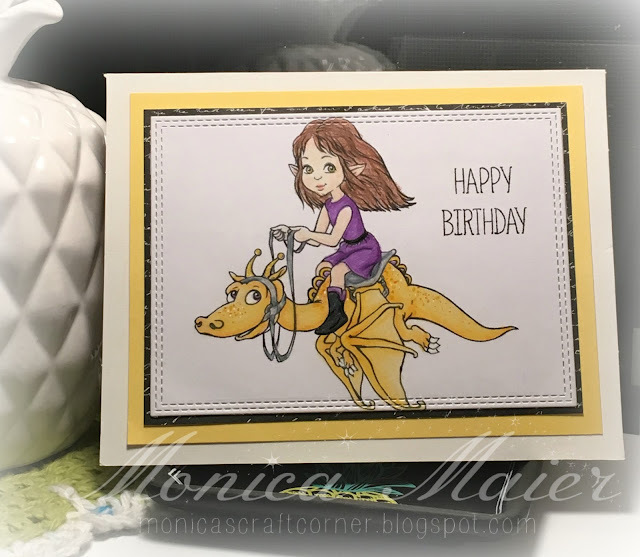 Hello it's Monica here to share my next card for our Birthday challenge. Our wonderful sponsor is Fabrika Fantasy. I used the adorable Flying Elf image. 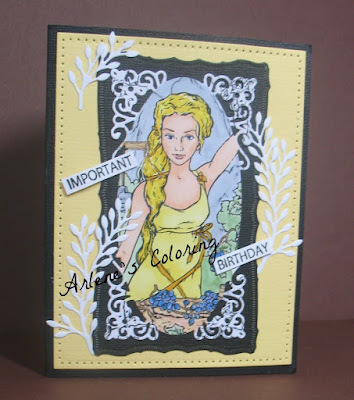 For all the details on the card, please visit me on my blog! You still have a few days to link up and play along with our challange. 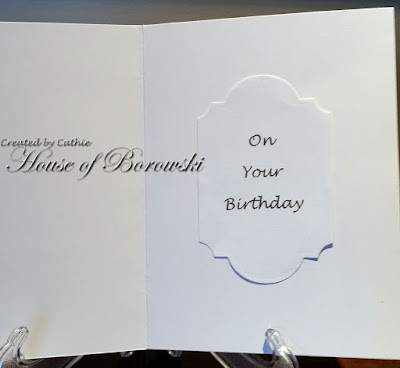 Loving what we've seen so far, can't wait to see more Birthday cards in the link! 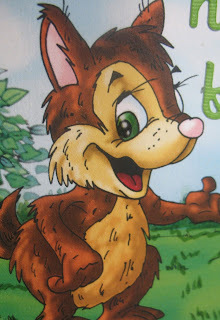 We are a small creative team writing and illustrating fantasy adventure and children's books. We love to draw fun and amusing characters, and are happy to offer them to you as digital stamps. We hope you like these digital images and they help make your creations bright, interesting and memorable! Doesn't this remind you of the movie How to train your Dragon? This is the image Flying Elf by Fabrika Fantasy, and isn't it so cool! For more information about this card, you can find more information here. 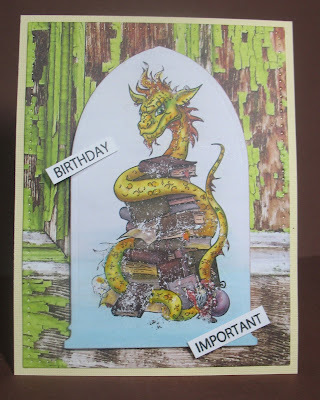 I am sharing a card inspired by April's Challenge - Birthdays. Our sponsor is FabrikaFantasy. 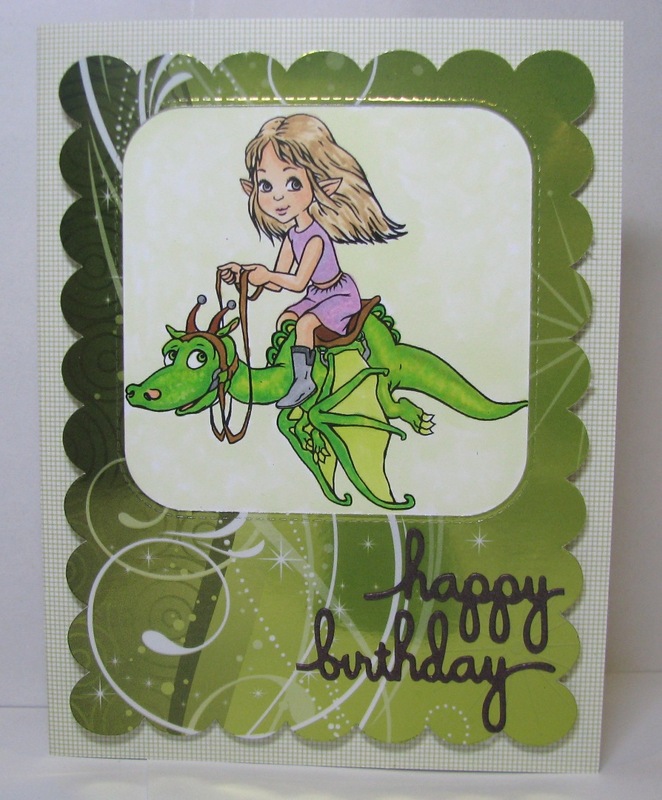 I use the Wise Dragon image from FabrikaFantasy digi stamp for my card. 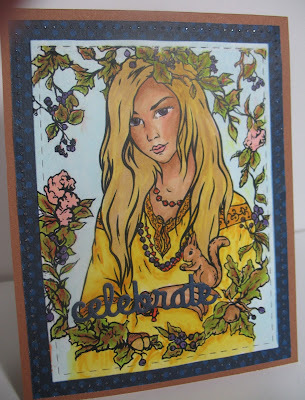 I colored with pencil, trimmed, and mount on a dry embossed panel which was stamped with Hero Arts Magical Background. 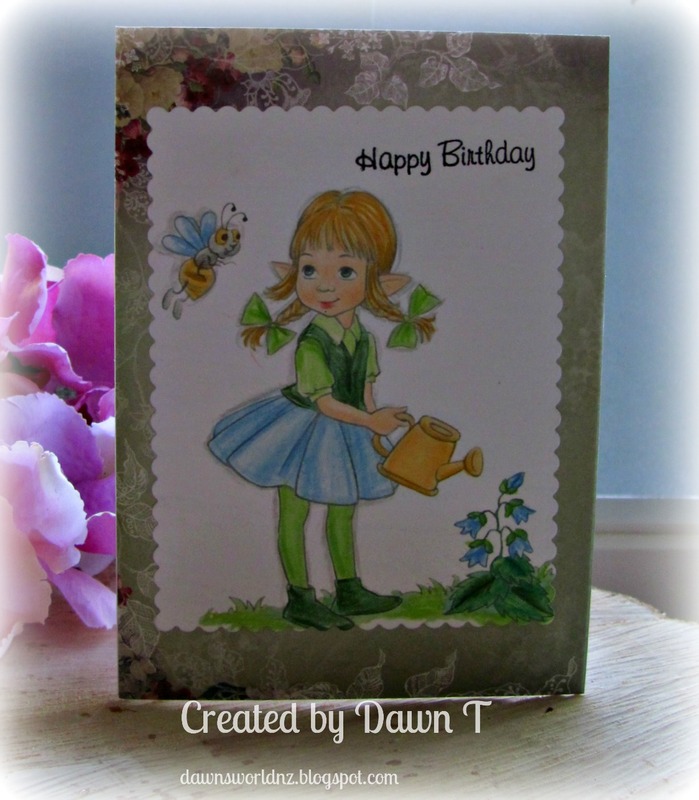 Today I used my creative license to give FabrikaFantacy's Autumn Fairy a Spring look. So what do you think? But even if you disagree, I think the Autumn Fairy is a really pretty image to color. 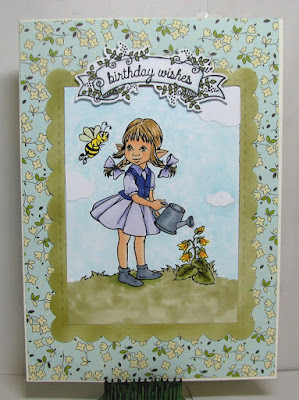 April's challenge is Birthdays. Our sponsor is FabrikaFantacy. Come join in the fun. Click the Montly Challenge button on the right sidebar to get the details. Monica here with today's card. 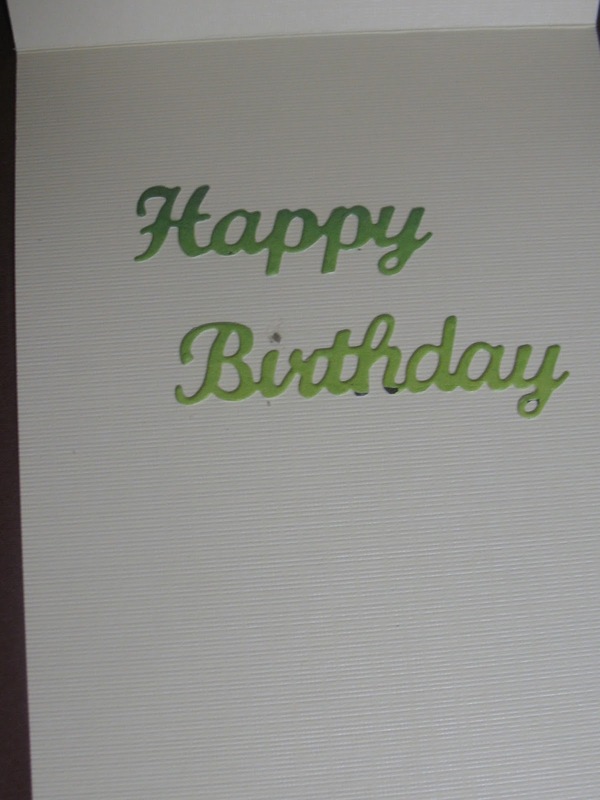 I was going for a springy birthday card. 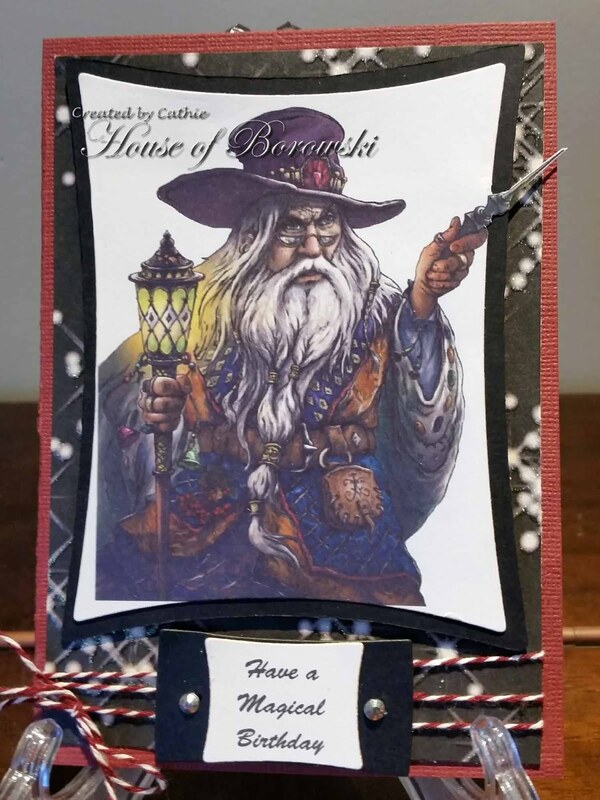 Hope you join us with your birthday creations this month for a chance to win a prize from our wonderful sponsor Fabrika Fantasy. 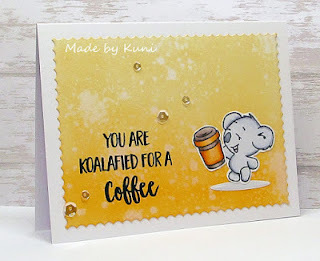 To see more info on the card, please visit Monica's Craft Corner! Can't wait to see what you all have to share with us. 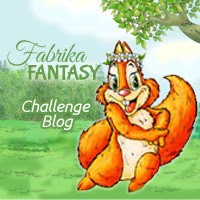 My sample for Fabrika Fantasy is a fantastical image. I'm one for fantasy, whether it's reading, movies or images. So are my sons. This card is sitting on my desk for my son's birthday. 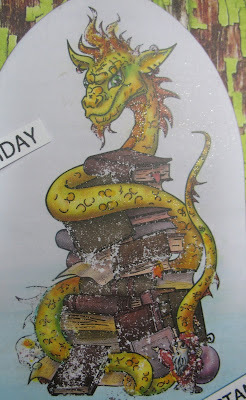 He's a teacher and likes science fiction and fantastic dragons. I thought this fit the bill. I knew the minute I saw this image that I wanted to make it a bookmark! This image is Wise Dragon by Fabrika Fantasy, and I used Copic fluorescent on the books to make it really bright and hopefully easier to find! 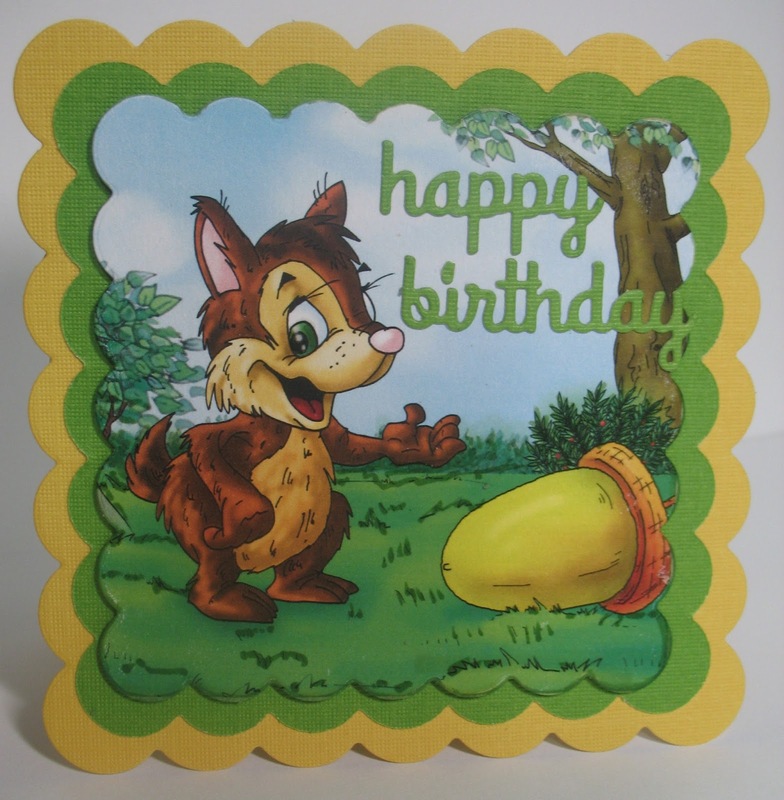 I'm going to give this in a birthday card to my beautiful niece who is a Kindergarten teacher. Her students will love it. The fishtail banners dies from My Favorite Things make a great bookmark shape. For more information, you can visit me here. Monika here to share my card with you today. 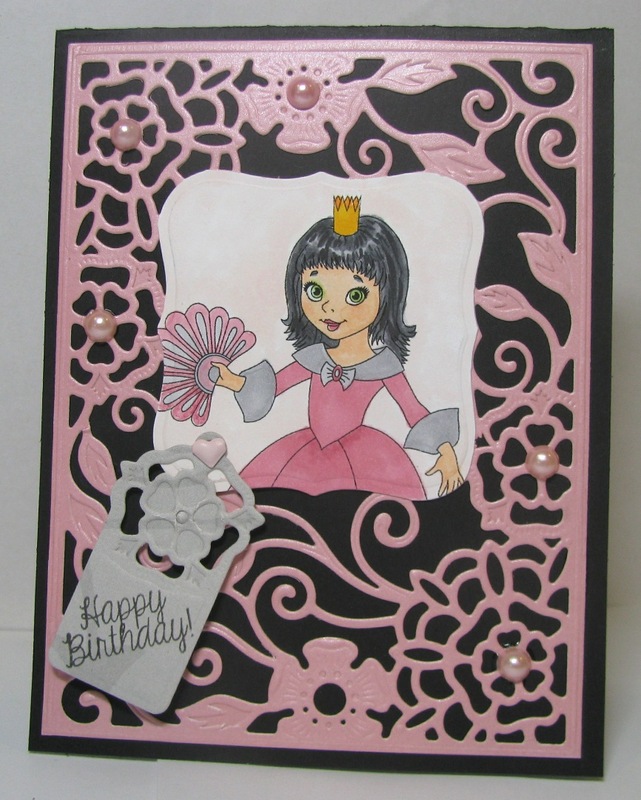 Card decorated with paper flowers and crystals. Hi, all. It's a "WINNER"y day! 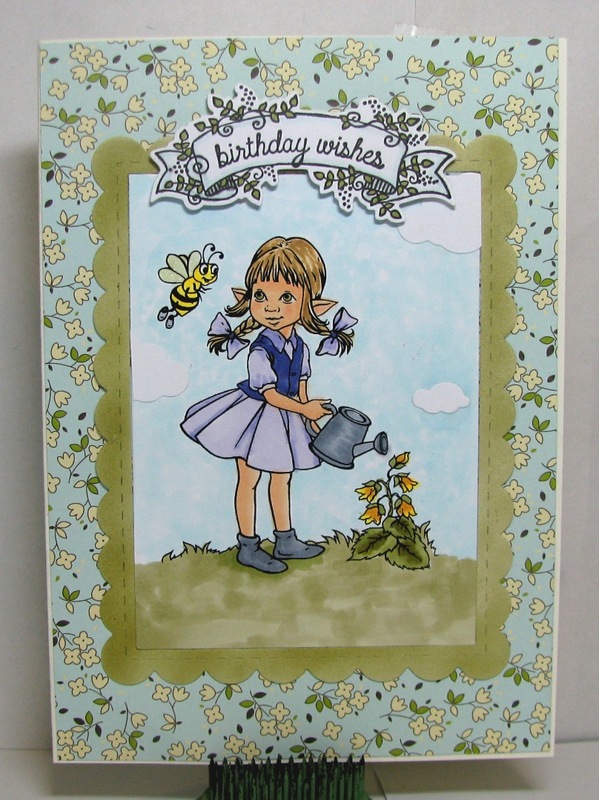 The March sponsor was Di's Digi Stamps, the challenge winner will receive $12 voucher to Di's Digi Stamps shop. Congratulations Kuni . 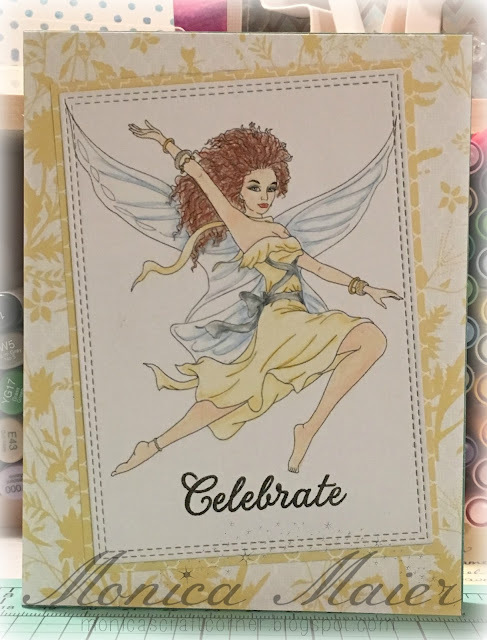 Please email thedcdivas@gmail.com with your email address and Arlene will send the information to Di's Digi Stamp Shop so you will receive your gift voucher. Now let's take a look of some of the DT's favorites. Cindy thought it was tough to choose, the gallery was filled with cuddly, sweet, and cute animals with various style of projects. However Cornelia's use of both positive and negative space make an impression on her. 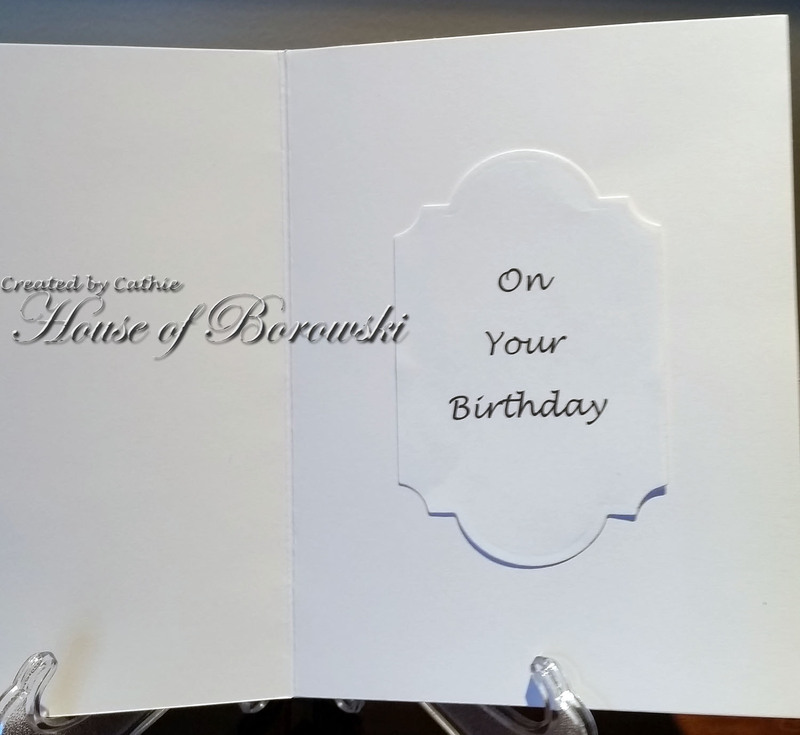 Monika loved this one card from Heather - White, black and shades of gray are timeless. Thank you all for joining in the March challenge. 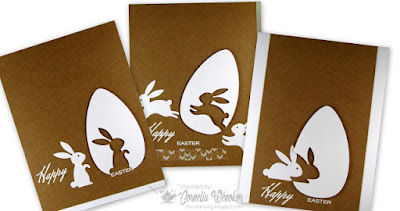 Looking forward to seeing your new creations in the April challenge. Arlene couldn't resist this lovely young woman, Beautiful Nymph at Fabrika Fantasy. Cathie has also chosen one of the pre-coloured images.